In conversation with Akshay Narvekar, Founder and Creative Director, Bombay Shirt Company, who speaks about his brand and its future expansion plans. Customisation in clothing has come a long way with a number of brands that has come forward in the category. Bombay Shirt Company is one amongst the many of these brands marrying contemporary product design and technology with old school tailoring techniques. Launched in 2012 as an online custom shirt brand, Bombay Shirt Company ventured into the international markets with its first ever store in Dubai’s The Central Park Towers, DIFC (Dubai International Financial Centre) and another flagship store in New York, few weeks later. The store is located at 223 Mott Street in SoHo. Bombay Shirt Company has also simplified the reordering process, as a profile of each customer is created and his measurements are stored for the next time the customer places an order, whether it is placed online or at one of its stores. Likewise, if a customer has a shirt that fits well, he can send it to the company or bring it to one of its locations and its measurements will be taken and used for his Bombay Shirt Company orders. We talk to Akshay Narvekar, Founder and Creative Director, Bombay Shirt Company, about the brand and its expansion plans going forward. Tell us about the brand, its inception and journey so far. Bombay Shirt Company was launched in 2012 as an online custom shirt brand and over the course of time, it became a hybrid of online- offline and has 8 stores across the world. We opened our first offline store in Mumbai during the second year and as the business started to take off later, we opened a second store again in Mumbai as well as in Delhi and Bengaluru. Today, the company is averaging orders of more than 250 shirts a day. The majority of our stores are franchises and the company plans to continue to grow through franchising. We believe that custom made shouldn't necessarily mean expensive – by selling directly to customers, we cut out the middle men and pass the savings on to the customer. Tell us about the product range and various customization options that Bombay Shirt Company offers to its consumers. In terms of product range, the base product will always be the varied selection of fabrics out of which we make customized shirts. We offer only the finest fabrics like Egyptian cotton and linens that are sourced from some of the largest mills in Europe, India, Turkey and Japan. We offer our customers to select from a wide range of custom details, from the type of cuff they want to the collar and cut they prefer, without affecting the price of the shirt. We also have stylists present at every store to help you choose better. Who are your target consumers? Also, what is the price range of products at Bombay Shirt Company? We don’t really have a target consumer because a product like shirt is for everyone. We offer shirts for both men and women; however women shirts are not the focus for us right now. The fabric starts from Rs.2,000 and goes on to Rs.75,000 for premium choice of fabrics. We offer range of fabric options and the idea is to provide solid options in every price point, so that there is something for everyone at the store. And these prices are inclusive of everything ranging from customization of size, collar type, cuffs, monograms, etc. Tell us about the concept and idea behind the launch of the brand. In the past, when people needed good, fitted shirt, they would go to the fabric market, pick up fabric, go to a tailor for stitching, then to a third person to buy desired accessories, so it used to become very hectic. So, when I moved back to India from US and I was looking for someone who offered this service, I was surprised to find out that nobody offered this service. I had a background in apparel lifestyle which made me to consider that I should start something in this front, where I could provide the customers a one-stop seamless experience – whether through a store or online – where the consumers could get a very simple and easy way to get a customized shirt. Bombay Shirt Company is able to offer custom-made shirts that are of the same quality as some of the other better brands, such as Eton of Sweden, but at a more affordable price point. This is our value proposition. Bombay Shirt Company has recently forayed into international markets with its store in Dubai and later a flagship store in New York. What made you round up on Dubai for your international debut? What do you think will be the response from both these markets in terms of sales, etc.? One reason why we ended up on Dubai for our international debut is that the market in Dubai is similar to what we have in India and so it would definitely help us in some way. We were extremely excited to mark our first international venture; Dubai has always been on our radar and was the first obvious choice to set up base outside India. We hope that our existing and new clientele in Dubai enjoy the latest BSC experience. We are also excited to mark our first venture in the United States. We lay great focus on the provenance of our products. As far as responses from both these markets are concerned, it will remain good for every market who wants quality shirts at different price points; regardless of whether you are selling in Mumbai, Hyderabad, Dubai or New York, the market will be welcoming basis your product quality. Tell us about the collection and customization options available at the newly opened Dubai and also New York store. Every option available in the Dubai and the New York store is the same as any of our other stores in India. Spread across 350 sq.ft., the Dubai store showcases the finest fabrics ranging from Egyptian cottons, linens, denims, flannels and much more, sourced from some of the biggest mills in Europe, India, Turkey and Japan. Customers at the newly opened store will find varied assortment of both casual and formal shirt designs ranging from solids, stripes, checks to quirky prints. With well trained and knowledgeable store staff, the brand renders styling guidance through stylists with a master tailor on hand to help one find the perfect fit. The New York based SoHo boutique is also staffed by experts who measure each customer for the perfect fit and stylists who are trained in the intricacies of fabric and styling guide each customer through design options. The fabric selected is the price differential and a wide range of options are available. Shirts are priced from $59 to $1,200, depending on the fabric selected, with most shirts priced at under $200. Elucidate on the interiors of the Dubai and the New York store. All our stores are designed in almost the same fashion though there are a few changes at every outlet but a basic theme is always followed; like in terms of materials used, in terms of colours used, etc. The Dubai store is designed in line with BSC stores as a plush mix of wood, concretre and pastel shades. Talking about the New York outlet which is located at 223 Mott St, the atelier is designed in line with BSC stores’ minimalist and understated aesthetic, incorporating wood and stylish interiors that reflect the brand’s contemporary sensibility. Introduce us with your manufacturing units and your designing team. Where do you source your fabrics from? Our fabrics are sourced centrally from our manufacturing unit in Mumbai. We send the swatches across our stores so that customers could look at the swatch and select the fabric. We have a network of about 8- 10 vendors across the world who specialize in different types of fabrics and we have very tight network. As we open new stores, the company adds more factories with each one manufacturing for three stores. Tell us about your recent round of investment. We had raised $1 million (Rs. 6.6 crores) in June, 2016, and the funding was used for investment in technology infrastructure, key hires and expansion through offline stores. Tell us about your retail presence and also about your expansion plans. 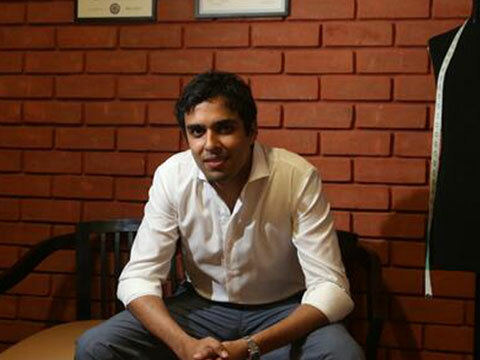 Bombay Shirt Company has six stores in India, one in Dubai and one in New York. We are also in talks with 3-4 partners for opening stores in various cities across the country. I think by the end of the financial year, we would witness launch of around 3-4 more stores in India. Internationally too, we are in talks with few people in few countries but there is no confirmation on the same as of now. But of course, we are planning for expansion in different geographies. Do you think franchise is a viable model for expansion? What are your plans to expand through this model? I think franchise is a great model for expansion. For a brand that is small and doesn’t have infinite amount of capital for investing, franchise totally makes sense. A franchise helps the brand/ firm in scaling up faster, in being present across geographies quicker and it obviously magnifies the brand. We are totally up for this model for expanding our reach. We give rigorous training to the staffs at the franchisee stores and also send our trained staffs to spend time in each of the newly opened franchisee stores.